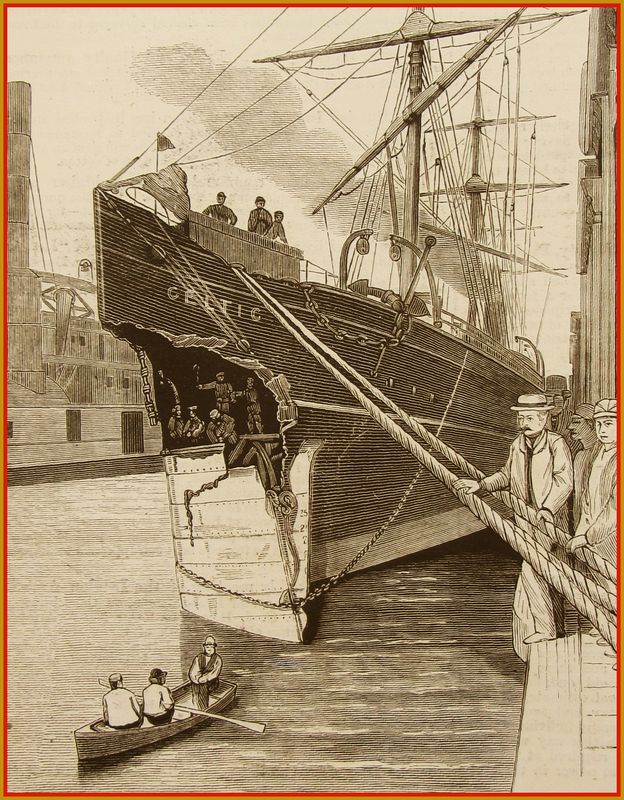 Late on the afternoon of 19 May 1887 White Star Line’s Celtic (1872), steaming toward New York, collided with fleetmate Britannic (1874), bound for Liverpool, in thick fog about 350 miles east of Sandy Hook, New Jersey. The two liners struck at almost right angles. Celtic’s bow dived some 10 feet into Britannic, port side aft. Celtic then fell back and struck Britannic two more times before sliding past the vessel. Six Britannic steerage passengers were killed immediately; another six were never found and are presumed to have been washed overboard. There were no deaths on board Celtic. Although both vessels were severely damaged, only Britannic was in actual danger of sinking. Sensing danger, many of Britannic’s passengers began panicking and rushed the lifeboats. Capt. Hugh Hamilton Perry, wielding a pistol, was able to restore order. The boats were soon filled with women and children (and a few cowardly men). Although her lifeboats were launched, Britannic remained afloat. After several hours afloat several lifeboats were rowed back to the damaged liner; Celtic retrieved the others. The next morning, Wilson Line’s Marengo and Inman Line’s British Queen arrived on the scene to lend assistance. The four liners slowly steamed up the New Jersey coast and into New York Harbor. One of Britannic’s passengers was two-year-old Eleanor Roosevelt, future wife of US President Franklin D. Roosevelt. As panic broke out onboard Britannic, Eleanor—traveling with father Elliot, mother Anna and aunt Tissie—was lowered kicking and screaming into a lifeboat. After Celtic returned the family to New York, Eleanor steadfastly refused to board another liner. Her parents went to Europe without her, leaving the child in the care of family members. It is said that Eleanor never outgrew her fear of water.